Why Not to Buy Low Volume Stocks? My friend Krishna Nair is a man of few words and he has a habit of learning things by burning hands as he is still in the learning curve in stock market trading. However all of us can get benefitted with his experience which gets us to the fact that one should avoid getting into the stock which has low volume stocks or whose daily volume being traded in the market is negligible. The story goes back one year when as a gullible trader; he got an advice from his friend to buy in Indian Terrain Fashions Limited and like a good friend he acted on his advice and bought 1000 stocks and later on as per Stock Market Murphy's law; the stock fell and he approached his friend for advice and he guided him to buy additional 1000 stocks to average the stock price. 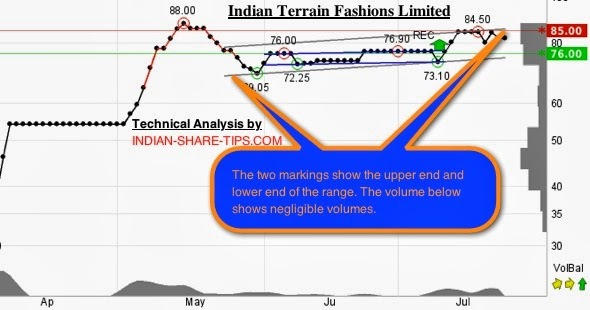 The stock kept on going down and finally he ended with approx 6000 shares of Indian Terrain Fashions Limited and he was not able to sell any of them as he was sitting on a huge loss. Finally when the upmove came in the stock he was not able to get out of the stock as stock was being thinly traded and finally he could dispose of his holding in more than 3 months time frame by selling his stocks in bits and pieces. Why we are writing this as today he has been finally able to dispose of all his stocks and he has been able to get some profit which is just equivalent to the saving interest as he could not get the best price while selling due to low volume in trading and it took him 3 months to sell 6000 shares i.e. from end May to End July 13. Why he was not able to sell as stock was thinly traded and very few trades use to take place. We are not against the stock but following mistakes should be avoided to avoid any financial loss as it is your hard earned money. (a) Avoid getting into illiquid stock as selling is a problem in such stocks can be only sold through the timings specified in Periodic call auction process and as a net result; you have very limited time of placing order in such type of stocks. (b) Avoid getting into the averaging of the stocks as a falling stock is like a falling knife and this fact is applicable to any kind of good stock unless you have some sound fundamental reason to get into the stock. (c) Low volume stocks can be easily manipulated as to show an upmove in the stock; it has to just move above the level of 85 and it can be done just by trading with less than 1000 shares i.e. with just a small capital of Rs 85000; one can show this stock as if it is moving in high spirits. Thus first thing before entering in the stock; you have to make sure that it has sufficient volume. We are thankful to our friend who took our advice sincerely and is able to get out of the stock and the gratitude is for the fact that he has been candid in sharing his story. He has earlier also shared his personal experience that how he used the lookin period during a policy to get out of it before he was getting locked in a wrong policy. Looking not to get struck in such type of situation, than remember to check out the short term holding stocks in Indian market and use our sure tip of the day for your intraday tips requirement. Dear readers do share your experiences below in the comments form and if you like the post do remember to share it through Facebook and Twitter.